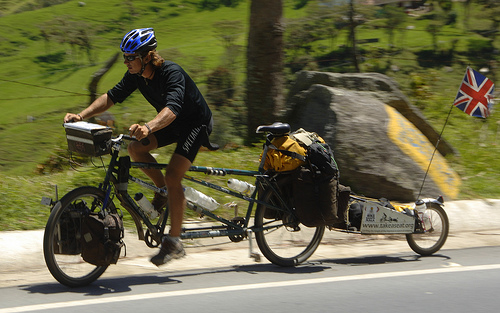 In 2006 Dominic set out on a tandem to ride from Alaska to Patagonia, picking up random stokers along the way. Two and a bit years later he arrived in the southern-most point of South America with two friends in tow. The book, Take A Seat, is his chronicle of the journey. Like all travel/adventure books it often falls into the I did this/I did that mode of writing, but thankfully Dominic did enough on his trip to enable him to cherry pick the best and keep the reader from getting bored. Dominic and fully loaded tandem with trailer. The book is at its best when Dominic is with the poorest of locals. Their friendliness and hospitality gave me pause to reflect on how I would treat a lost cycle tourer in my town. I doubt I’d welcome him in and make him part of my family. At these moments you also felt the book was giving you the best experience of Dominic’s travels. Like most adventurers who recount their stories he inevitably hits a stage where he wonders what the hell he’s doing out there. Some travel writers wallow in their own misery. Other travel writers like Paul Theroux are relentlessly optimistic (because they know you the reader aren’t there to be bored to death by weary details). Dominic falls somewhere in between. He doesn’t deny the details of his worn out and desolate state of mind but avoids (only just) wallowing in them too much. As a cycling book the experience of reading it is more about the locations and people therein rather than the experience of cycling. That’s probably a good thing as there are only so many works you can write about cycling (apparently…I dont seem to have hit that limit yet myself). Dominic’s prose can be a little too prosaic at times (and when he does try to get flowery it borders on embarrassing) but it does the job, is far from stilted, and makes the reading easy enough to let the journey take over.